Thursday is the annual celebration of love, but it’s also a time to show off cute, romantic outfits. Whether you have a date planned with your sweetheart, or you’re planning on watching the classic movie “Valentine’s Day” with your best gal pals (my plans exactly), there’s something out there for you to wear to celebrate the season. We’re in luck, because stores have a wide variety of Valentine’s Day-related pieces for you to rock on the flower and chocolate-filled day. If you’re going for a night out with a fun and flirty dress, Altar’d State is perfect. They have a wide variety of red dresses, as well as floral ones, so you have options based on your personal style. Additionally, their options will let you choose if you prefer a tighter dress versus a more relaxed, flowing one. Pair with a cute pair of boots or heels and some red lipstick, and you’ll be set. Francesca’s also has an array of Valentine’s Day options, with an entire section online. They do have some dresses, but I am a big fan of some of their red and pink tops that can be paired with jeans or a cute jean skirt. Specifically, they have a red ribbed top with a jean skirt that I think is a super cute ensemble, but you can totally make your own at home with what you have, too. I have a pair of red sandal wedges that I think would look so cute with an outfit like this. Charming Charlie’s is the place for jewelry, with multiple Valentine’s Day-themed earring sets. If you don’t want to be too obvious with heart-shaped earrings, I think some silver hoops or golden teardrop earrings would look great with a dress or nice top. Francesca’s has some adorable hair accessories, including heart-patterned headbands and red ribbon scrunchies. If you don’t want to get dressed up (I totally understand), there are multiple stores that have comfortable and cute choices for you. H&M has multiple sweatshirts that would be great for being relaxed and stylish. In addition to Francesca’s dressy tops, they have some trendy tees that are great for showing your independence and girl pride. Old Navy is also a great option for those of you going for a relaxed look. 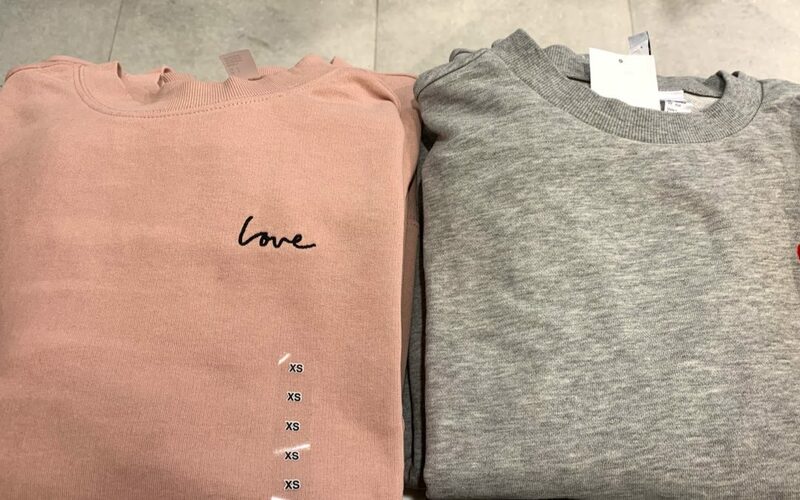 They have multiple graphic tees that are perfect for Valentine’s Day, including a pink tee with a heart that simply states to love one another and a gray one that encourages us to let our hearts be kind. If you want a little accessory to go with your outfit, Target has some super cute socks to celebrate the holiday. Not only do they have a big stash in the dollar section, but they also have super cute socks online, too, to celebrate with your gals and to show your love for chocolate (totally me). Loft has some wonderful Valentine’s Day options as well. There are multiple sweaters, ranging from striped with hearts to a simple heather gray with the word “love” scripted across the front. If you want a more dressy, professional look, there is a super cute pink blouse dotted with little hearts, and a stunning red sundress that I am absolutely in love with. Although their prices are a little bit higher, the quality of the clothes is amazing and totally worth it. I understand that reds and pinks aren’t for everyone, but there are wonderful alternatives out there that will still allow you to go with the love vibe of the day. Target has multiple shirts about love that are perfect for a variety of personalities, including one for dog lovers and one inspiring others to radiate love. Additionally, Old Navy has a top that I love that says “love where you are.” I think it’s perfect because Valentine’s Day is not just about loving others. Although that is a huge and important part of the day, I think that this top is a great reminder for us all to embrace where we are, love our lives in this moment, and enjoy the memories we are making. I think that my favorite top right now (which is also perfect for Valentine’s Day) is a shirt from Loft. It’s a black tee with an embroidered heart that reads “A little love goes a long way.” Loft is donating 60% of each shirt to St. Jude to fund cancer research for all of the sweet children fighting for their lives. Not only does the shirt spread positivity and encouragement, but it is also spreading love into the world by giving to others. I can spend all day long giving you advice on what to wear, but in the end, it’s your decision. Whether you’re eager about a date or are cool hanging with your friends, eating chocolate and watching “Friends,” Valentine’s Day is all about love. The most important thing is that you love yourself in what you’re wearing. Wear something that you feel comfortable and confident in. Spread love and light to others, but make sure you show a little love to yourself, too, because you are so loved. God has created you for a purpose and loves you so much. I love you all for reading these and supporting me. Know I appreciate you this Valentine’s Day and always. Although it’s cliché, I just want to remind all of you that the world is a better place because you’re here. Embrace that, and continue to spread love and that message to everyone you encounter. Happy Valentine’s Day, loves. Eat some chocolate, be kind, and stay fabulous always.